Lesson: Using SketchList 3D to create new materials. Summary: Objects in SketchList 3D are made up of materials. Most likely an object will be a board made up of a some sort of wood. However there are no limitations on type of object you can create or the type of material you might use to create that object. SketchList 3D supports any type of material – metal, stone, glass, cloth, leather. You can even scan in photographs of rooms, appliances, furniture, artwork, fireplaces and turn those into materials to be represented on an “object” such as a wall in your design. There are two aspects of materials. 1. What does it look like which the material functions deal with, and 2. what is it cut from – which is the work of the Stock form. More later. Understand what the material the difference between what a material looks like and awhat material will it be cut from — the act of “stocking” the fully sized material in your database. Learn to add new materials using SketchList 3D grain textures and colors. Learn to create your own materials by importing images. Understand the concept of “stocking” the material. 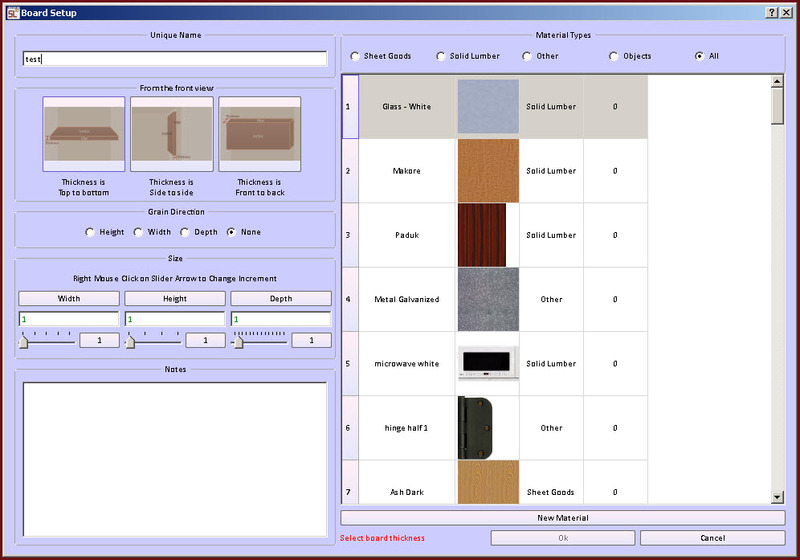 Learn to understand the relationship between the material and the optimized layout report. Material is the substance with which boards are made in SketchList 3D. Texture is what a material looks like. Stocking is the act of defining a sheet or board of a material by entering its sizes and grain direction. 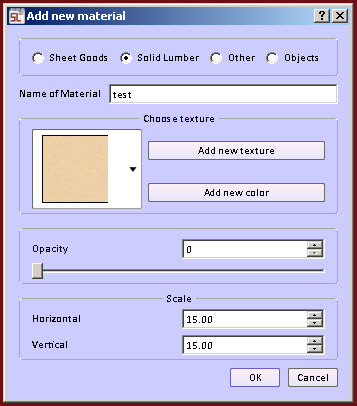 Insert a board and select a material. When a new board form appears as you are inserting a board into a container you’ll notice the right side of the new board form deals with materials. You can make the list of available materials to smaller group by clicking the radio button to refine the total number of materials shown by type. 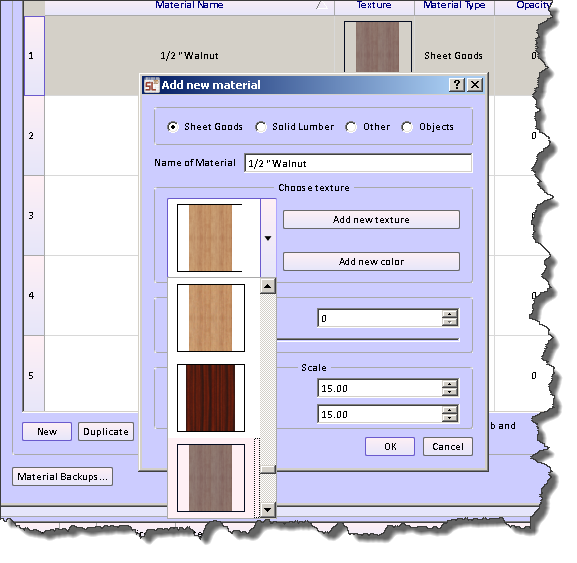 Then scroll the list up or down and pick the material you want to use for that board. The next time you use the new board form the material you selected last time will be shown at the top of the list. Note that the bottom right of this form is a button for a new material. That is one way you can access the new material form. At the other way to open a new material form is to select materials from the SketchList main screen menu. When you first click the materials button a form will open showing you the materials that are currently in the database. At this point you can delete the material. NOTE: you cannot delete a material that is currently in use the product in a project. If you do this a warning message will be generated telling you the project (s) using that material. If you delete that project you can then delete the material. You can duplicate a material and change some aspect – for example modify the amount of transparency that that material has. When you click the new button at the bottom of this form the new material window opens. The add new material form contains entries. For texture you can click on the downward facing arrow in the texture box and select the grain you want to use on the new material. 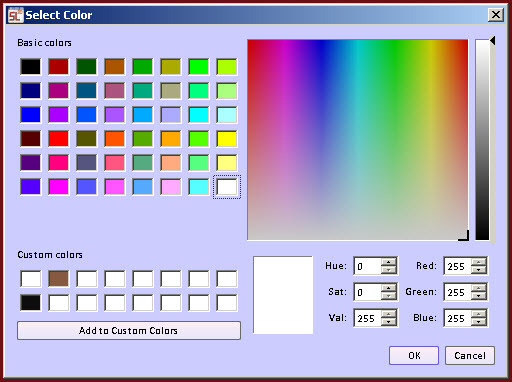 You can select a color (without grain texture) by clicking add new color. You can import your own image from a graphics file by clicking add new texture. Find the image file and click ok.
You can set the amount of opacity (transparency) by sliding the bar left and right. Scale has to do with the size of the texture tiles used in the images. Generally the default of 15 x 15 is suitable. If you use a texture and find that the image of that texture looks off in some way you may want to come back and adjust these variables. When you import your own image – say for example of an appliance to be used in your design – you can set the horizontal and vertical scales to be the actual horizontal and vertical sizes of the object in the image. Import your own image to use as a texture. After select the file that contains the texture or image you want to import click okay. That “material” will now appear on the material list and on the new board form. 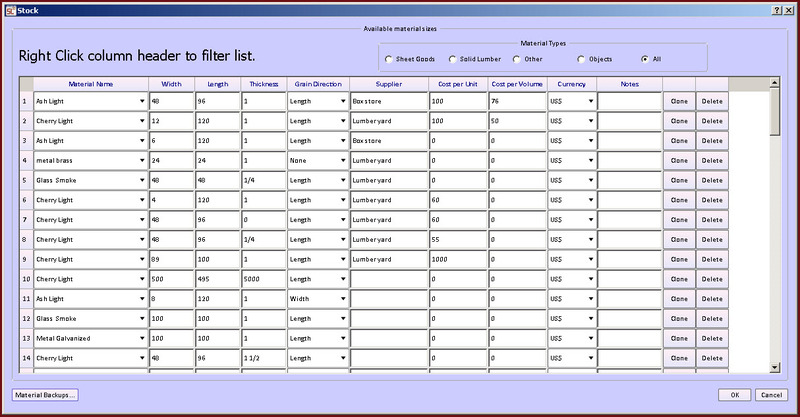 Entering material in the stock database. Version 4 of SketchList 3D intentionally separates the concept of a material having a size from the appearance of a material. In version 3 the size of the material was part of the definition of a material. One problem with that is if you created a design based on the thought that your material provider would supply you with a material of a specific size and in fact that size wasn’t available you would have to go through your entire design and change the materials to the size that is available. You can open the stock form by clicking the materials menu item in the SketchList main form. Clicking any column heading will sort the spreadsheet based on that column. You can filter the materials by clicking the radio buttons the top of the form. Material name – contains the name of the material and if you click the down arrow you will see the texture file associated with that material. Width – is the width of the board from which parts of that material will be cut. Length – is the length of the board from which parts of that material will be cut. Thickness – is the thickness of the board from which parts of that material will be cut. Grain direction – you can pick the grain direction by clicking the down arrow and selecting the direction desired. You can select none for grain direction. The grain direction though should be consistent with your use of grain direction. If for example you specify a board has a certain grain direction but specify in the stock database at that material has no grain direction you will get unpredicted results. This may become apparent when and if you run the optimized layout diagram. Supplier you can enter the supplier for a given material. You can enter the cost for material on a cost per unit (piece) or cost per volume (board feet). You can select the currency using the pull down menu in the currency column. Notes can be entered in the note column. Clone is to make an exact copy of an existing material this is useful when you have a specific type of material for example 4 x 8’ plywood that is going to be exactly the same except for the different thicknesses. Just clone the existing sheet of plywood. Then change the thickness as needed and click the OK button. Delete a given material is in the final column. In version 4 you don’t have to deal with the size materials that the parts are being cut from unless and until you get to the material layout optimization stage. If you’re just doing design and don’t care about layouts are optimizing then you’ve saved some work. If you do care about the layout you can use the facilities in the optimized layout diagram form to assign board sizes to given parts. This is covered in the post video on optimized layout diagrams in SketchList 3D. There are more than 30 posts and videos about this on the webpage the most current are as follows.